Quench Your Taste for Blood as a Man-Eating Shark! Most animals on Earth may eat to live, but sharks live to eat. No one in the water is safe when one of these veritable killing machines enter the scene; they’ll eat you up and use your bones as a toothpick! You’ll see it for yourself in Hungry Shark Evolution. Get into the fins of some of the biggest and nastiest sharks around, and then turn the ocean into your personal all-you-can-eat buffet. Fish, crabs, birds, humans and anything else that moves and bleeds are yours to dine on. When you’ve sunk your teeth into enough living flesh, you can then improve your sharks in all kinds of wild and crazy ways to ensure the feeding frenzy never has to end. Eating is the name of the game here. As a shark, your stomach is bottomless and your hunger is eternal. To survive, you must eat, eat and eat some more. You can never stop; to do so will spell death. Prowl the ocean for food, devour everything you can clamp your jaws around, and show everyone why you’re the world’s most perfect predator. Explore sprawling and beautiful underwater environments. Eat fish, sea turtles, pelicans, crustaceans, divers, beachgoers and more! Avoid deadly undersea hazards, like mines, poisons, volcanic geysers and torpedo-launching submarines. Destroy boats to exert your dominance over the ocean. Leap into the air to catch airborne prey with your mighty jaws. Face off against enormous bosses that will take more than brute force to kill. Discover hidden treasures in the deepest depths of the ocean. Sharks may not have changed much since they shared the world with the dinosaurs, but they can still find ways to evolve in Hungry Shark Evolution. As you play the game, you can unlock all sorts of extra goodies to make the sea’s greatest killers even more deadly. 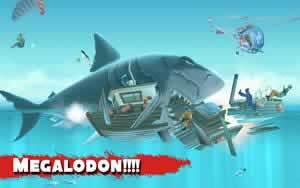 Take control of the most notorious species to ever swim in the ocean, including the mako, hammerhead, tiger, great white shark and even the mighty megalodon. Unlock super-powered sharks that command the elements themselves. Improve your sharks’ statistics over time. Increase swimming speed, bite force, boost potential and total size. Go into a feeding frenzy with style. Dress your sharks up with a variety of accessories, including Mohawks, crowns, top hats, pimping gold chains and more. Put on a flak harness to absorb more damage before you die. Get a baby shark to gobble up even more food for you. Outfit your shark with lasers and jetpacks! 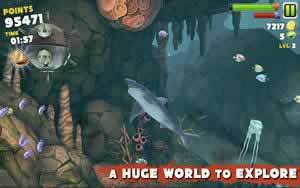 The Best Shark Game Ever! The rule of cool is running at an all-time high in Hungry Shark Evolution. You’ll be hard-pressed to find a game with more blood-pumping and blood-spilling action than this. You’ll have an even harder time finding a better opportunity to play as the ultimate predator on Earth. Honestly, you should have been on board at the mere mention of equipping a shark with a laser gun. 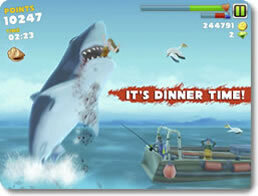 Download Hungry Shark Evolution and let the binge-eating begin!